Man, I had such a productive day yesterday. First, my mom and I took our recycling to the center. I’ve been collecting wine corks to make cork boards, but it takes quite a lot just to make a decent sized one and it’s hard to find them around here because not very many people drink wine here. I’ve been asking restaurants, but they only give me four or five a week. So when I saw that they were having a wine festival I knew I couldn’t give up that opportunity. I had called the guy, who was running the event last week to explain and ask him if I could come, but he didn’t remember me nor did he understand what I was asking for. I had expected this would happen, so I made sure to get their early before it got all chaotic and busy. That was the next thing we did. We dropped off some containers so the different wineries could put their wine corks in them. Since I’m under 21 he had some other guy go with me around to the different tables. He explained everything for me which made my time there a lot less stressful (I’m terrible at explaining what I’m wanting. I don’t know why, but no one ever seems to get it.) I told them I would come get them later. Then we went dumpster diving. We went to several places down town, mostly to see what was in them. I didn’t need anything, but I just like to know for future reference and just in case I find something that I know someone else could use. We saw a cabinet, a tire, a vintage suitcase, and what looked to be a cardboard thing that carpet gets rolled on and we kept that for the kids. We did our first round at the mall. We haven’t gone before because mall security is always driving around, but this time we braved it and just did it quickly. We mostly found boxes, but we did find a computer monitor. I’m not sure if it works or not, but I have a pretty exciting plan for it anyways. After we ate lunch and went to Wal-Mart (my worst nightmare) we went dumpster diving again. It was an electrical supply store that was by another place we had to stop at, so it was just a random decision. I’m not 100 percent sure what we found, actually I have no idea what it was, but it had all these wires sticking out and there was about 50 lone wires that were in the bottom. We’ve decided that anytime we find electronics or wires that we’re going to strip the copper from them and sell it. We were pretty excited by our find. Later in the day I went back to get my corks. I got a pretty good bag full; not as much as I wanted, but more than I would have gotten in like half a year of just restaurants alone so I’m grateful for it. I hadn’t even thought about trying to come up with something, but as soon as she said it, I knew exactly what we could use. You see, my dad works at a gym facility and a couple of weeks ago they had to replace one of the belt (I think it’s called a belt, but just that part you walk and run on) of the treadmill. He asked me if I wanted it and my first reaction was, yeah that could make an awesome yoga mat. Of course it was later that I realized how silly that was. It was way too rough and knowing myself I could get seriously hurt on that. It’s not padded either, so I discarded my ridiculous idea and it has been sitting out there ever since waiting for me to use it. So as soon as she said it I knew that’s what we should use. My dad cut it with a box cutter and you can see the kitties eating below. Take my word for it, I thought they were adorable before, but they’re way cuter now that they’re eating on their upcycled place mats. 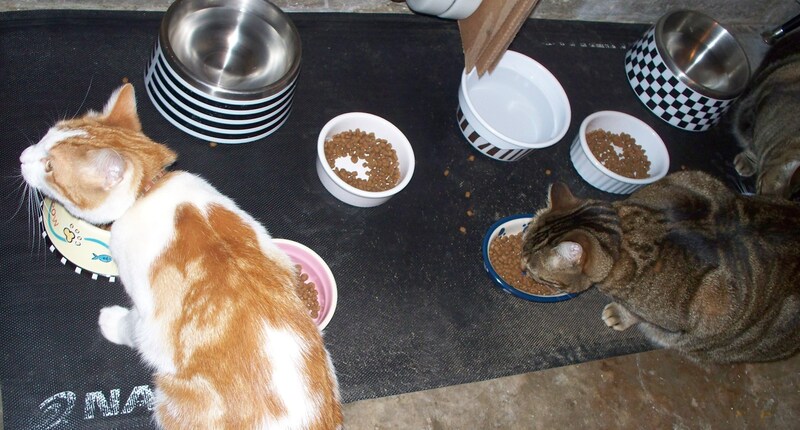 The picture below is of Cheerio (orange and white) and Melody and Harmony. The other two were scared by the camera, but you can see the two front paws of Mr. T. (He wasn’t named after the official Mr. T. We only named him that because he had a white T marked on his face.) Mystique is the other one and yes she was named after the Mystique in x-men. She is all black and I knew the second she was born that she was either going to be a Mystique or a Wolverine. She was a girl, so a Mystique she became. It suits her. Someday I’ll tell you all about them and how I came to find each one. In my opinion they’re very entertaining and they’re always on my mind, so it’s taken a lot of discipline not to write about them every time. 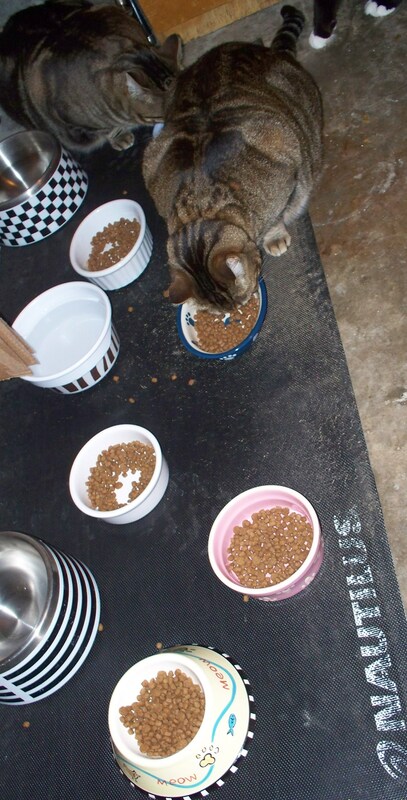 Melody and Harmony and a hint of Mr. T eating on their new place mats. So anyways, pretty much that was my day yesterday. Once again I must say, I love dumpster diving. Whether I find things that are universally useful or just the things that have the potential to be, it pretty much makes the world my oyster and there is nothing more exciting than that. What a great day I had, dumpster diving wise. Considering that what I’ve found so far hasn’t really been too noteworthy lately, I’m still pretty easily excited when it comes to what I can find in the dumpster. At the mall center where I usually find myself diving, my mom and I found hundreds of cards and envelopes. They seemed to be mostly thanksgiving themed cards, (I didn’t even know you sent people a card for Thanksgiving. Boy I’m behind on sending those out.) but there were some birthday, Christmas and etc. And the envelopes we could use for any occasion. We didn’t find any clothes, but in the Game Stop dumpster I found cases for some games which gives me hope that maybe someday I can actually find something besides boxes in there. We went to a Dollar General dumpster for no reason except for just plain fun. We found an Atari gaming console. It was new, but it looked similar to the ones made back in the day. The only thing wrong with it is that one of the controller sticks broke. The top part would just set, but it wouldn’t connect to the bottom part that connected it to the control. As long as you didn’t hold it upside down it was fine. We decided to donate it. Some kid whose parents can’t afford a fancy Xbox or whatever might like to have it. We found a huge bag of dog food, laundry detergent, bleach, some little plastic baskets, the new version of Alice in Wonderland and The Wrestler. Both DVD’s work fine, but the laundry detergent and dog food had a hole. Since most of the stuff was still in the containers we asked our neighbor if she wanted it. She did and it was awesome. In the bottom of the dumpster there were rice crispy treats and various other junk food snacks. We couldn’t reach them, so we didn’t get them. I’m pretty thrilled with our finds even though most of it isn’t something that we use it’s still nice to be able to help other people. So…yesterday, I got an abundance of spoons. I found my new favorite stash. It was just a normal day, I had just gotten out of class which means my next stop was Cherry Berry. I had to wait for a couple of people to go away, so I could get to the trash mostly unseen. Once I got there, I realized something. There were not any spoons. There were three green spoons which I got, but they weren’t the kind I need now. There are two types of Cherry Berry spoons. The green ones which are thicker and therefore not the kind that will work for this project or the pink ones which are still thicker than your average plastic spoons. For my current project, I need the pink ones. I had already made up my mind to get 17 pink spoons and once I make up my mind, there is no going back. Cherry Berry is in this strip mall type of a place and I knew in the alley way behind all the stores would be their trash, so slowly and apprehensively I drove to the back to see what was there. I saw boxes everywhere and shipping pallets, small dumpsters (perfect for diving), huge dumpsters (not so perfect for diving) and I saw medium dumpsters (okay for diving). I saw all dumpsters and assessed them as quickly as I could. Then I saw these cut little trash bags filled with spoons and cups and lots of wasted frozen yogurt. I finished driving to the end of the stores because I thought I was going to come back later and get them, but there was no exit so I had to turn around and drive by the spoons again. My mom said she was surprised that I did that. I’m not sure why. It was easier than digging in the in front of the store. It was probably a little riskier because I could have been caught without an excuse like ‘I dropped my cell phone in here’ or something. But no one was around and unless someone came out one of the store doors, no one would even know I had been there. My biggest fear is still getting caught. I would be a lot more productive if I didn’t have that fear, but I’m working on that. So yes, I got my 17 spoons and a lot more. Was it scary? Yeah. Do I feel a little crazy? Yep. Does my car still smell like Cherry Berry?…welllll… Was it totally worth it? Absolutely. More than crazy, I feel like a drug junkie. You know the kind that do whatever it takes to get their stuff. I’m so addicted to the process that I’ll do whatever it takes to get it. But then there is the haunting image of the trash that I saw. I couldn’t possibly use it all, not for the reason that I couldn’t find something to do with it, but because I simply don’t have the time. It’s overwhelmingly frustrating because I could take a whole semi truck full and it wouldn’t even make a dent. I could find a way to take it all, but then it would just be there again tomorrow. All those wasted boxes, clothes, electronics just ruining our land. We waste so many resources to even get the stuff then we just throw it away. I don’t understand why those places can’t recycle those boxes at least. I understand why businesses won’t give their stuff away for free. Even if it’s selfish, I still understand. I don’t understand why they can’t recycle. It’s so irresponsible. America is so irresponsible. Anyways, thanks for reading and happy diving. eWaste is the popular term for discarded electronic products such as computers, VCRs, cameras, cell phones, keyboards, handheld devices, and the associated peripheral devices that are frequently discarded or replaced due to upgrades or changing technology standards. It’s to recycle E-waste for several reasons. First, when electronics are thrown into landfills it releases toxic chemicals, carcinogens and heavy metals like lead, mercury, cadmium, chromium, chlorinated solvents, dioxins and brominated flame retardants, into the air, water and soil. When some of these toxins are burned at low temperatures they create more toxins such as halogenated dioxins and furans – some of the most toxic substances known to humankind. These toxins can cause different kinds of cancers, reproductive disorders, and many other health problems. Most of these toxins are made up of elements which means although they change forms they will never disappear. Instead they will accumulate in the biosphere and in the food chain. Second, recycling reduces greenhouse gas emissions, pollution, saves energy, and saves resources by extracting fewer raw materials from the earth. To add to that problem, most companies that claim to recycle don’t do it responsibly. According to Basel Action Network (BAN) (http://e-stewards.org/the-e-waste-crisis/) An estimated 70-80% of the e-waste that’s given to recyclers is exported to less developed countries. Once there, primitive technologies such as open air burning and riverside acid baths are used to extract a few materials. The rest of the toxic materials are usually dumped. Unlike other countries in the world, the U.S. sends a significant portion of its hazardous e-waste to U.S. prisons to process in less-regulated environments without the worker protections and rights afforded in the private sector. Moreover, such operations amount to government subsidies, undermining the development of responsible private-sector recycling infra-structure and distorting the economics of recycling. 1. The nation now dumps between 300 million and 400 million electronic items per year, and less than 20% of that e-waste is recycled. 2. E-waste represents 2% of America’s trash in landfills, but it equals 70% of overall toxic waste. The extreme amount of lead in electronics alone causes damage in the central and peripheral nervous systems, the blood and the kidneys. 3. Because computer processing power doubles roughly every two years, many old computers are being abandoned. Only 15% recycle their computers, which means the other 85% end up in landfills. 4. It’s energy efficient to rebuild old computers, but only about 2% of PCs ever find their way to a second user. 5. About 50 millions cell phones are replaced worldwide a month, and only 10% are recycled. If we recycled just a million cell phones, it would reduce greenhouse gas emissions equal to taking 1,368 cars off the road for a year. 6. Flat panel computer monitors and notebooks often contain small amounts of mercury in the bulbs used to light them. 7. Cathode ray tubes in older TVs and computers typically contain about 4 lbs of lead and sometimes as much as 7 lbs. 8. The European Union banned e-waste from landfills in the 1990s, and current laws hold manufacturers responsible for e-waste disposal. 9. Large amounts of e-waste have been sent to countries such as China, India and Kenya, where lower environmental standards and working conditions make processing e-waste more profitable. Around 80 % of the e-waste in the U.S. is exported to Asia. 10. E-waste legislation in the United States is currently stalled at the state level. Just 24 states have passed or proposed take-back laws. However, as of January 1, 2011, covered electronics are completely banned in West Virginia. Portable DVD players with LCD screens.